Developer Quote: "Air Media Center's high-performance, retina optimized streaming leaves other standard media streaming apps in the dust when it comes to directly accessing the movies, personal videos, photos and music stored on your Mac or PC." To explain a bit better, Air Media Center is composed of two different applications: Air Media Center, the app that you install on your iOS device, and Air Media Server, the server application that you install on your computer. After installing and launching both programs, you can then browse and select media from your computer by using your Air Media Center app. The amount of space this app could save on your phone is phenomenal. Get the free server application to your Mac or PC from the Air Dynamic website here . 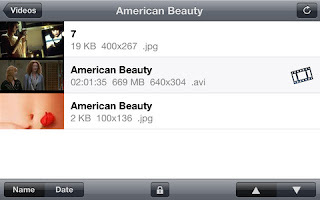 This file sharing app makes it so easy to stream your special media collection from your computer to your iPhone or iPad. What I like best about it though is that it lets you index and search photos on your computer. Select alphabetical indexing, indexing by date, or even ascending and descending lists. For my large photo collection, this is ideal. 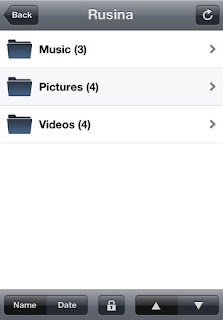 I really don't want to waste room on my phone having photos physically reside there. Just tap to enlarge photos, flip or scroll through thumbnails to view. For other folks, being able to access their huge video files is another space saving wonder. Just tap on a movie to play. Oh, and get this cool music feature - you can use AirPlay from your iOS device to your Mac running AirServer, or to your Apple TV! Lots of goodies indeed on this media streaming app! COOL CONCLUSION: "Air Media Center provides the ultimate in media center portability when it comes to streaming your favorite photo, video or music files."